It’s not often that one finds buried treasure, but that’s exactly what happened in Wayland High School’s History Building as we prepared to move to a new campus. Amidst the dusty collection of maps featuring the defunct USSR, decades-old textbooks describing how Negroes are seeking equality, and film strips pieced together with brittle scotch tape, was a gray plastic Samsonite briefcase, circa 1975. After a quick scan, we realized that we had in our hands the astonishing personal collection of Lt. Col. Martin W. Joyce (1899-1962), the 46 year old Army officer who was appointed commanding officer of Dachau Concentration Camp just days after its liberation in late April, 1945. 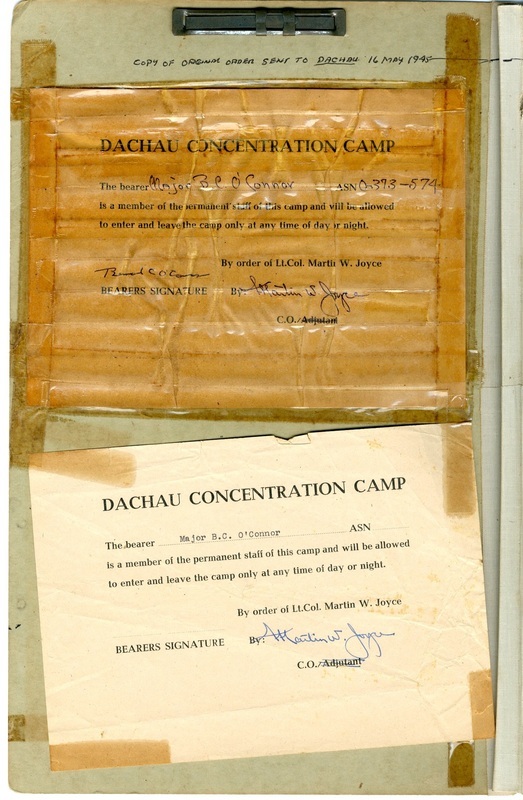 Among the 250 original documents are personal letters, an 85 page scrapbook, his military files, Dachau documents, and a photo album presented to him by Yugoslavian survivors, who credit Joyce and the Americans with saving the lives of some 32,000 survivors. It's clad in blue and gray striped fabric of prison clothing. Who was this fellow Joyce and what is his life story? How did he handle the unimaginable circumstances of a post-Nazi Dachau? Who were the people behind the names on the letters he received? How did such a collection end up at Wayland High School and what should we do with it? These were among the primary questions the Wayland High School Project team tackled in the Spring of 2012 and concluded investigating by June, 2013. With generous funding provided by the Wayland Public Schools Foundation, we present Joyce's e-Biography and make the Lt. Col. Martin W. Joyce Papers available to the general public. Joyce’s life story is almost too hard to believe, and is both a testament to one man’s stunning personal development as well as a riveting journey through the 20th century. The Joyce Papers now permanently reside in the Holocaust Museum archives under the stewardship of Judy Cohen, Director of the Photographic Reference Collection. Special thanks to good folks at the Wayland Public Schools Foundation, who made this and Wayland High School History Project Vols. I-V possible. We also are indebted to Mr. Gerry Sullivan, Lt. Col. Joyce's brother Albert's nephew, whose enthusiasm and family history tips were invaluable. Mr. Tom McNulty, retired Massachusetts State Police and State Police Museum archivist, generously provided his time and shared photographs and research on life as a state cop in the 1920's and 30's. The New England Historic and Genealogical Society's Mr. Tim Sales' insights and guidance helped us both understand the multiple challenges of handling rare primary sources and how to write accurate and complete historical abstracts for the 85 Joyce Scrapbook and 75 Military File documents. And lastly, we thank Mary Barber, technology specialist at Wayland High School, for her unceasing energy and support.